Viviscal Man hair supplements are clinically researched to nourish thinning hair among men and promote the healthier, thicker, fuller looking hair from within. Male-pattern baldness is the most common type of hair loss in men. Viviscal Man hair growth vitamins are scientifically formulated for men with temporary hair loss, to reduce hair shedding and nourish hair follicles from within. 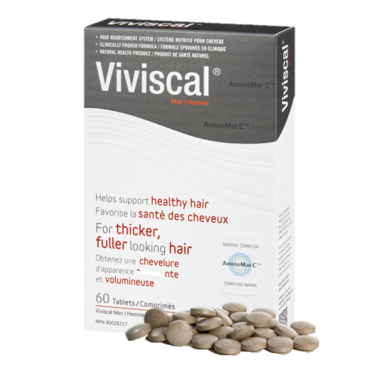 Viviscal Man vitamin supplements nourish thinning hair in men and promote existing hair growth. These hair vitamins contain ingredients of natural origins. Viviscal Man is backed by nearly 25 years of continuous research and has been researched in clinical trials with some of the world’s leading clinicians. Viviscal Man is the #1 selling naturally sourced hair supplement for men in North America. If your diet lacks specific essential nutrients for hair, including vitamins, minerals or proteins, it can affect the condition and strength of hair. Male pattern baldness occurs when dihydrotestosterone (DHT) is produced in the body, which inhibits hair growth by preventing the supply of nutrients to the hair follicle, and ultimately this can lead to male hair loss. Viviscal Man hair growth pills contain the exclusive marine complex AminoMar C, as well as healthy hair nutrients including Vitamin C, and Silica. Viviscal Man hair loss pills have been scientifically proven to nourish hair from within and to promote healthier, thicker, fuller looking hair from within. Viviscal Man is part of the complete Viviscal Hair Nourishment System, which include products to nourish hair from within (Viviscal Man hair supplements), prepare the scalp (Viviscal Gentle Shampoo and Moisturizing Conditioner), and add volume (Viviscal Volumising Hair Fibers). Glycerin, hydropropyl methycellulose, Magnesium stearate, maltodextrin, Microcrystalline cellulose, orange flavouring, Silicon dioxide.